The last thing you probably want to think about right now is making your favorite Thanksgiving recipes again. But I feel the need to conclude our meal with some lessons learned. I make a lot of the same dishes from year to year so I try to incrementally make them and the overall celebration better every year. Yesterday I tried one new recipe; something that used an old favorite of my husband's (corn) but in a more interesting way. I made corn pudding from a recipe I found online. It was fine but nothing special enough to repeat. Do you have a corn recipe you love? Please drop me a line in the comments. The best side dish of the night award goes to the Sweet Potato Souffle. Don't let the name "souffle" intimidate you. This recipe was one my mother picked up over the years and she passed it along to me. There's nothing complicated about it and when made right, it's heavenly. I've made it the last 3 years in a row and it didn't turn out right. I thought it was because I always cooked the souffle at my turkey cooking temperature of 325 but that wasn't the problem. At long last this year I finally got it right and it was worth the wait. I attribute my mishaps the last few years to being too insistent that I could make an organic version of my mom's version. Given the canned sweet potato options at my disposal, that was just not possible. As soon as I reverted to using the conventional ingredients, it magically worked out exactly as it should. Melt butter and brown sugar and pour over the potatoes. 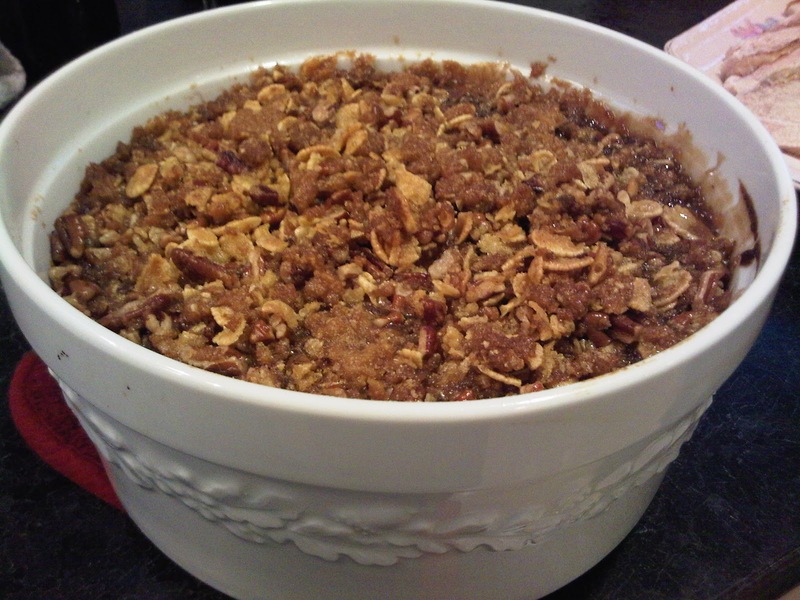 Sprinkle nuts and cornflakes on top and bake an additional 30 minutes. There are a couple of other takeaways from the meal. Next year I'll remember to send out the tablecloth to be steam pressed. The only tool that my well equipped kitchen still needs is a carving knife so I will certainly buy one of those before next year's meal. And of course, we will once again welcome family and friends to join us for laughs and conversation that make the food secondary. I agree that trying to "health-ify" traditional holiday recipes does not work well. Pineapple Bread Bake is especially unforgiving when any attempt to make it healthier is involved. Made as listed in the recipe it is very bad for you - but oh so delicious - change the recipe and it is not even worth eating. Plus, in my opinion, in a modified form it does not bring with it the happy memories of past family feasts. I think I learned my lesson. Now you've got me thinking about making Pineapple Bread Bake! Preheat the oven to 250 degrees. Blend 3 cups of corn kernels and the milk in a blender of food processor until smooth. Whip the butter, masa, and sugar together in the food processor until light and fluffy, about 2 minutes. Add all the ingredients, including the pureed corn and the remaining 3 cups qhile corn kernels, and mix well. Pour the mixture into a 9x13 pan. Cover tightly with aluminum foil. Set the pan in a large roasting pan. Pour enough cool water into the roasting pan to reach 3/4 inch up the outside of the 9x13 pan. Bake for 1 1/2 to 2 hours, or until the corn mixure registers 175 degrees and the corn mixture is set. Scoop out portions of the pudding and serve hot. If fresh masas is not available, use masa harina and adjust the ratio of dry masa to milk as directed on the package. I'm going to try this for sure. I've never used masa or masa harina but I'm pretty sure I've seen one of them at the store before. Thanks for the recipe, Christy! Great slices on the cold cuts. They are finely sliced and the arrangement has been very presentable.